6 years ago Dan De Oliveira and I began a tradition here in Chicago that lasted 3 years: The Beefeater Gin Boat Cruise. 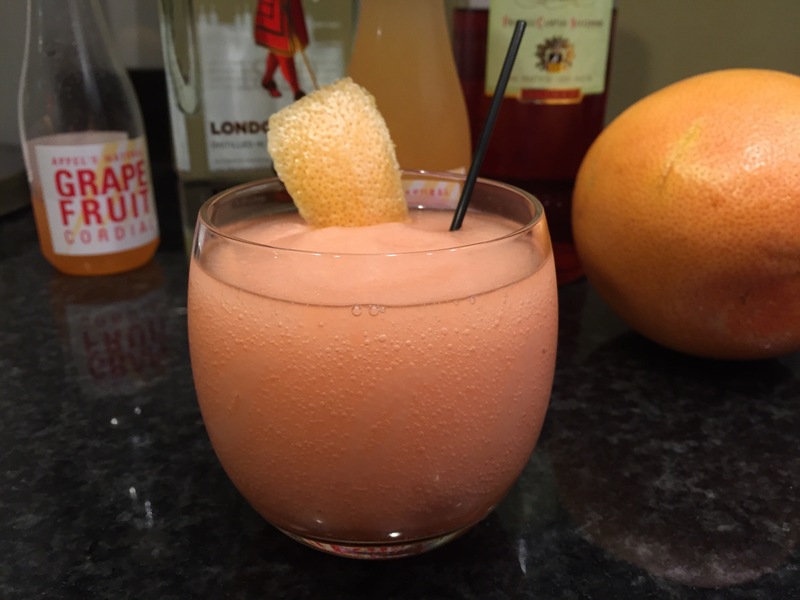 We turned some classic cocktails into frozen drinks and created some originals. Frozen Beefeater Gin Gimlets, Frozen Gin Lemon Ices, Frozen Aviations, Frozen Gin and Bitter Lemon. 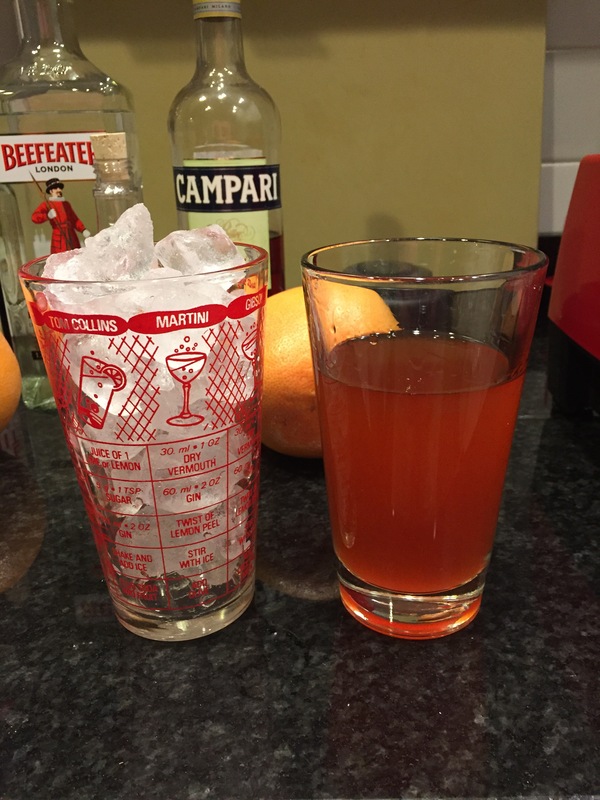 While we intended to make a frozen Negroni for the cruise, we opted for making a Summer Negroni which was a tall drink that included Grapefruit Cordial and Club Soda. 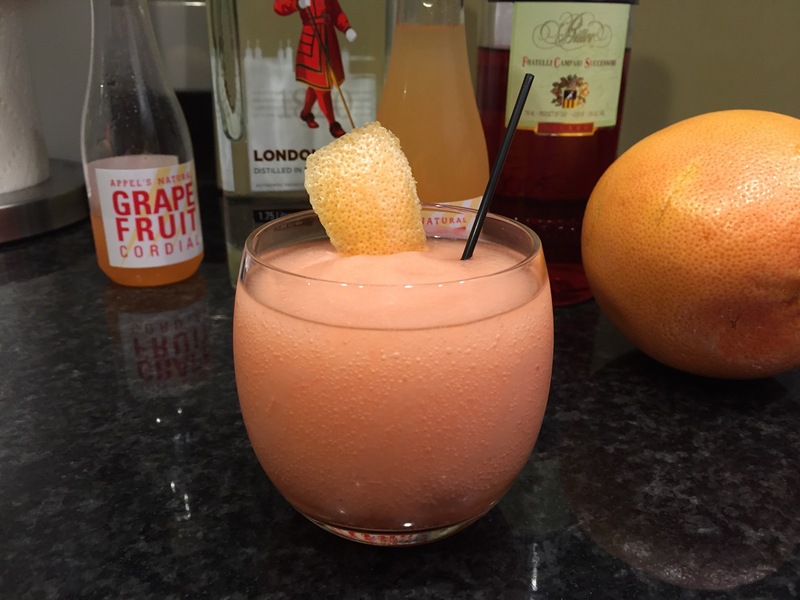 The addition of the citrus and acid of the grapefruit with the dilution of the club soda made this a refreshing summer long drink. But this works so well as a frozen drink with these ingredients that I wanted to share this for Negroni week 2016 and the upcoming summer. 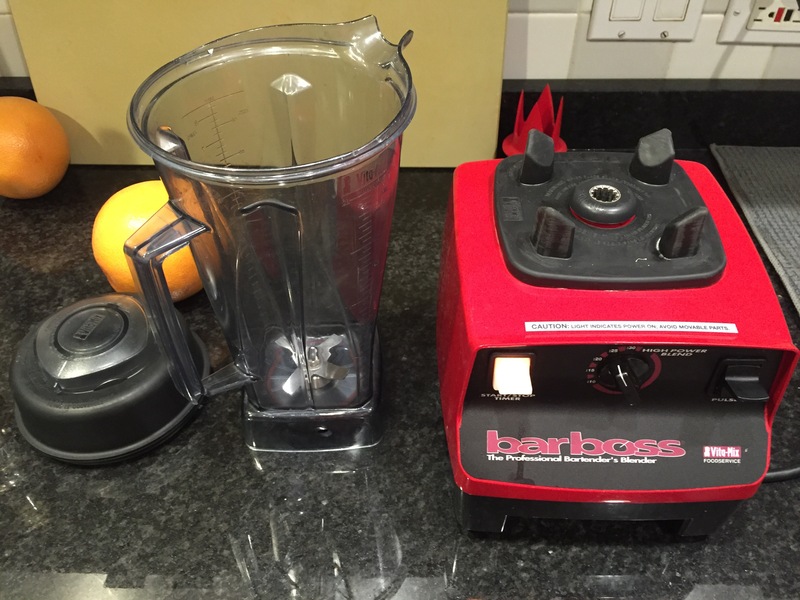 One thing about blender/frozen drinks is that the base ingredients need to be concentrated and not diluted in any way. This helps them stand up to the ice that they are blended with. This is where the grapefruit cordial/syrup really shines. It is concentrated and can bring all the spirits along with for the ride. 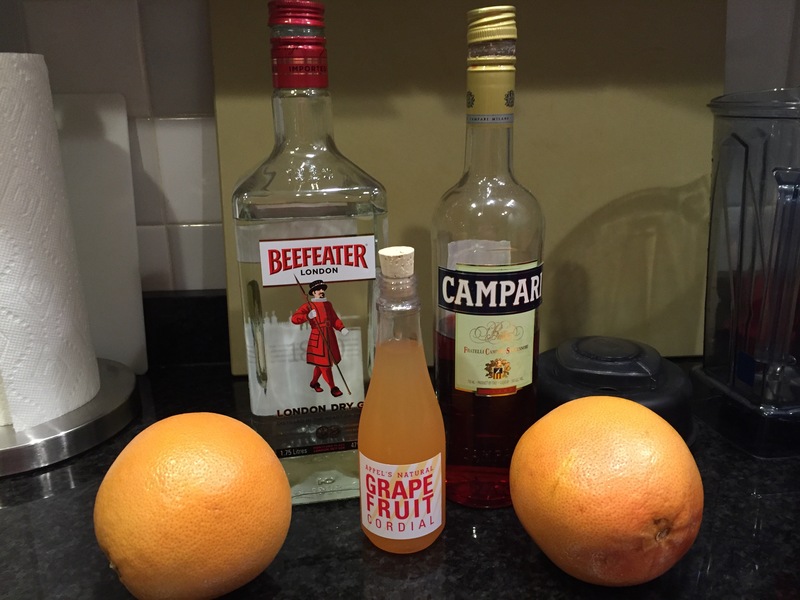 It also balances the bittersweetness of the Negroni with citrus and acid, something I have always found the Negroni missing. You also need to have the right balance of ice to mixer. Too much ice and it becomes snow and weak, too little ice and it becomes watery with ice floating. I find that for this recipe 1.5 pint glasses full of ice works perfectly. Adjust for more. I also find making one to be blender overkill. Make at least two at a time. Add Negroni mixture above to rocks glasses completely filled with ice. Pour back into rocks glass or coupe or wine goblet. As the Skinny drink craze kicks into high gear, I thought I would add a few thoughts on the whole concept and some alternatives to the pre-bottled mess that is being offered to take advantage of people’s desires for lower calorie and less aggressive flavored drinks. The problem is not with having lower calorie drinks or cocktails, but how you do them versus buying a pre-made drink or spirit. Just saying Skinny doesnt mean anything…If you drink a ton of them it adds up. And some of the Skinny offerings aren’t even very skinny to begin with if you read the fine print. I’d like to offer a few easy alternatives that anyone can do at home or in any bar, anywhere. There is the DIET/CLUB SODA OPTION, but that is obvious. The not so obvious ones that have been around forever are the use of club soda instead of sugared sodas or juices…or the use of club soda to cut your sugar soda in half. The later is what is generally called a “Presbyterian” or “press” when one has a spirit, and half club soda and half ginger ale or 7UP. This was originally done to cut the sweetness and syrupy taste of these drinks, especially if you are drinking many of them. But this has the added benefit of cutting the calories of your mixer in half. Voila! Skinny and not even tryin! The next alternative to make even greater savings on calories is to have a spirit and club soda and add a splash of something for a hint of flavor. Simply a “vodka soda and splash of cran” is a fairly well known cocktail already, but is a great way to skinnify your drink. The LESS MIXER OPTION If you enjoy drinks like Cosmos and Lemon Drops you can do the same thing to those style drinks by just using a splash of mixer, instead of the standard recipes. Like a vodka chilled and served up, with a splash of lime, cran and cointreau…or even just a splash of cran for taste and color. Not only do these drinks have less calories and are easy to make…they tend to be much easier on the stomach and palate, are much more refreshing, and give you better value by upping the spirits a bit and diminishing the mixers. But upping the spirits ratio might beg for one to also use a smaller glass. Smaller glasses is such an obvious way to make your drink skinnier, it gets overlooked the most. It forces you to ration your drink naturally. The last alternative is the homemade take on the “Vitamin Water” style of drink. A month ago I recreated a drink I made for Vosges Haute Chocolate and St Germain for the Southern Wine and Spirits quarterly Late Night Event. This one featured Vodka. Vodka is either very easy to mix with or very hard to mix with, depending on your point of view. I take the view that it is difficult to mix with and maintain any semblance of the vodka in the drink. My take on mixing would be to use very subtle flavors and taste sensations. I decided to do a “Vitamin Water” style drink with vodka. The tea itself is wonderful, but vodka and iced jasmine tea is 1 dimensional. 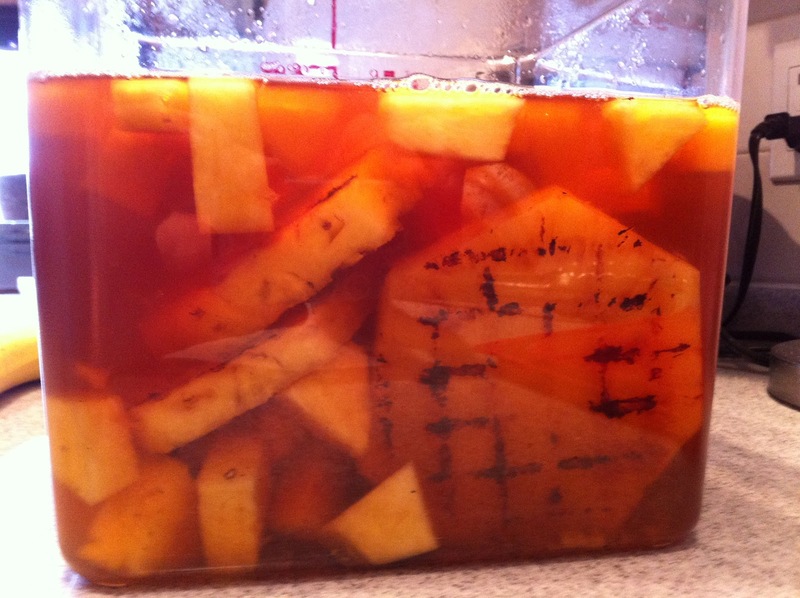 To add some subtle flavors and a little bit of acid and sugar for the palate, I grilled fresh pineapple and infused the tea for 1 or two days in the fridge. I do not crush or puree the pineapple. I only want the juices and flavors of the sliced and grilled pineapple to enter the tea and be in that subtle equilibrium. If I mashed the pineapple, I would have far too much juice, sugar and acid going on for what I want…But that would be a good drink or base for another option, just not this one here. 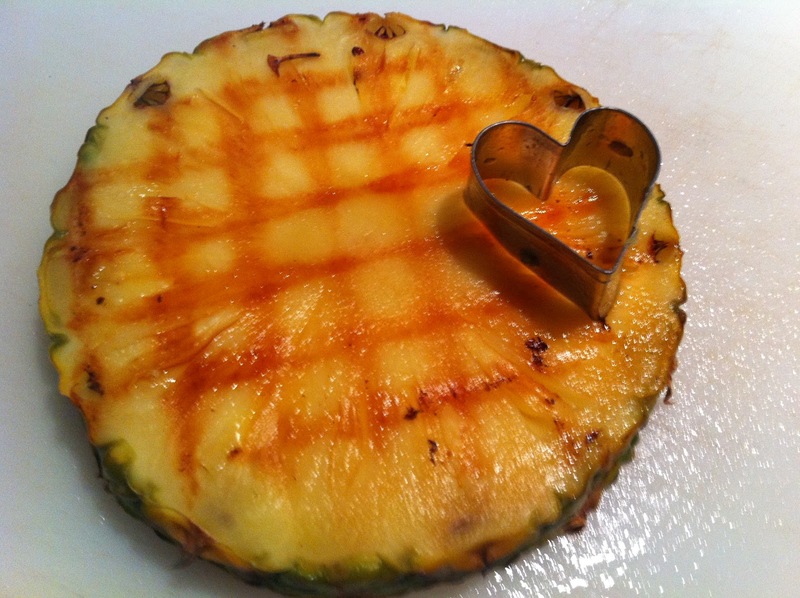 Remove the pineapple and then strain any other particles or pieces that have fallen off into the tea. This is really just a form of iced tea, but it lends itself nicely to a vodka drink. 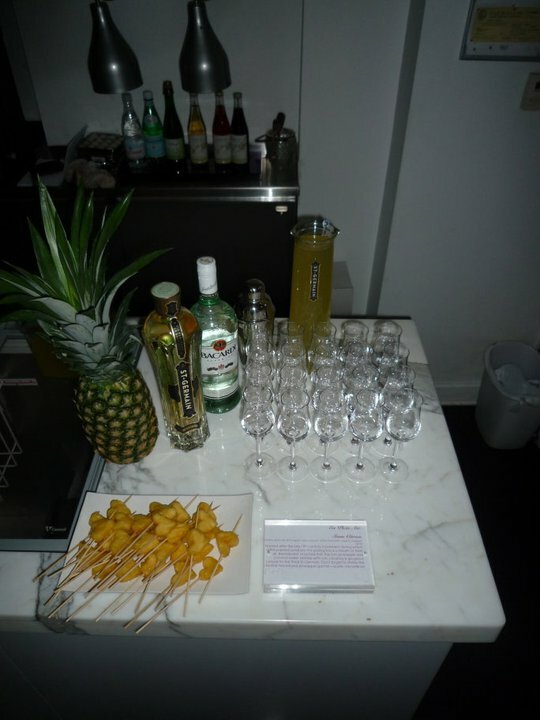 Now to make this a refreshing, tall drink just chill some vodka strain into a tall glass full of ice, and top with the the chilled, grilled pineapple Jasmine tea. 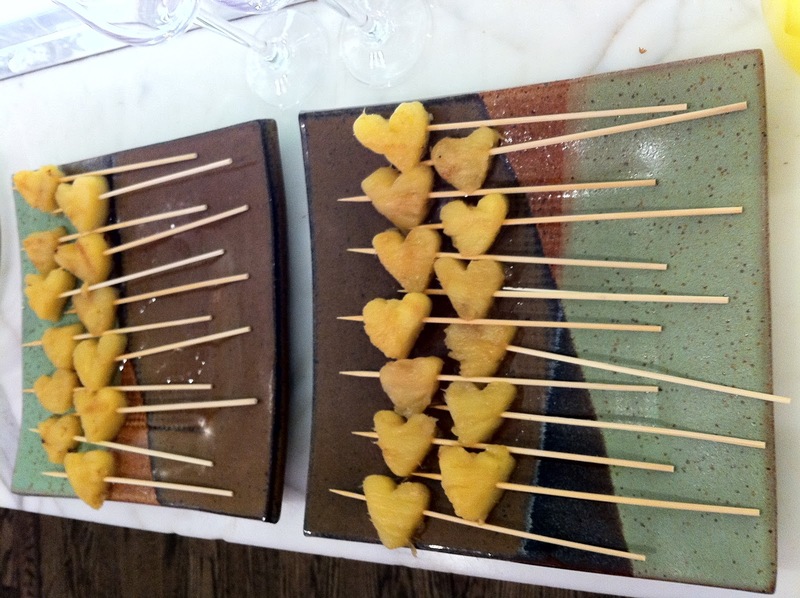 Add a piece of grilled pineapple for garnish…the pieces are delicious! This will keep in the fridge, sealed, for a week or more. And you dont have to put any vodka in it! Grill pieces until grill marks appear and rotate. Do this again and then flip. Same process for both sides. This will give you crisscross grill marks and the proper caramelization. When they are all done just add the pieces to the Jasmine Tea and keep in the fridge for at least 24 hours…48 ideally. You can leave the pineapple in if you wish, no straining or anything for a more natural looking drink….Or remove and strain for a beautifully clear tea/water. That is mostly an esthetic issue. En Plen Air was a cocktail I made for Valentines Day at Vosges Haute Chocolate Shop in Chicago in 2011. In the original I used coconut water and a little fresh made pineapple juice, but I liked the Jasmine tea infused with pineapple so much I decided to use it as a mixer. Use less mixer and in your mixed drinks…for example…lemon drop use less lemon sour mix and more vodka. 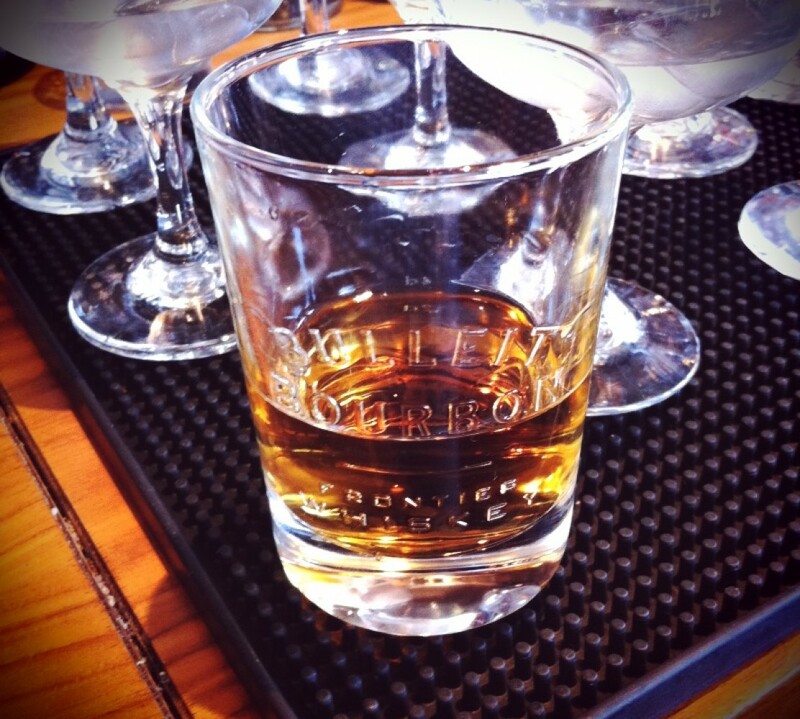 Use a smaller glass, especially with a higher spirit ratio like above. Also drink your cocktails on the rocks more often. They will last longer and stay cold longer and also dilute the higher spirit ratio drinks naturally as well. You can actually use the super low cal and less aggressive commercial versions offered, or make your own natural versions at home. The example I made above with grilled pineapple and Jasmine Tea, or just fresh lemonade made with double the water, or fresh orange juice that is mixed with water. Really delicious! !